Hello – I am back at last. Per usual with my absences, there was a long series of physical problems. But here I am, hoping to get back and stay back no matter what, as long as I can produce something worthwhile. So to my readers and those who get this passed to them, say a little prayer for my health. There are several Big Things I’d like to get done! So, let’s get going with these two topics. 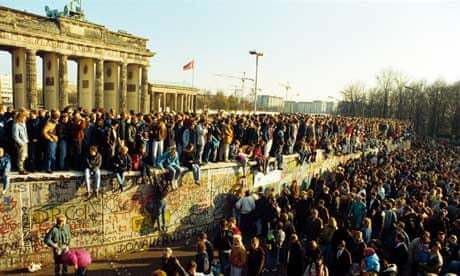 November 9 marks the 25th anniversary of the fall of the Todesmauer – the wall of death – which is what Berliners called the Berlin Wall. Built in 1961, the Wall encircled all of West Berlin, snaking along the “temporary” lines of division made in cutting Berlin up in the spring of 1945 after the fall of the Third Reich. It’s ironic to note that while the world hated Nazi Germany, so did most Berliners. In the last free election, Berlin did not vote in favor of the NSDAP – the Nazi Party. The destruction brought by Allied bombing and the atrocities of the Soviet Red Army in taking the city and then in the imposition of Stalinist Communism in their zone convinced those Berliners who needed it that Hitler was a horrible man, as were his minions. Eastern Germany was divided up between Poland (and a slice to the USSR) and the Soviets. The Soviet zone became East Germany while most of the Germans in the Polish and Soviet sectors were driven out 1945-48. West Berlin was the safety valve for those people- it was the safest way to get out of the German Democratic Republic (DDR) as the frontier along the western side was ever more fortified. By 1961, one out of five East Germans had left the DDR, and after 1955 most of that was through the subway or streetcars going to the Western sector! going right through towns, and the Wall itself, which sliced neighborhoods, families, friends, church congregations permanently into two camps. Over 200 people died trying to get out, over the wall and its fences, swimming, digging tunnels, hidden in cars. Four years later, the Wall came down, on this night. I remember clearly watching on television. What happened was a chance comment on East German television, as so much was going on in the East. People were leaving the DDR via Czechoslovakia and Hungary into neutral Austria; demonstrations were constant in the DDR itself; all of the Warsaw Pact nations of eastern Europe were in turmoil, and everyone in the West waited to see if the Soviets would invade and use military power as they had in 1953 (DDR), 1956 (Hungary), 1968 (Czechoslovakia) and as the Polish army had in their own country. A reporter asked the party boss when would new regulations take place for border crossings out of the DDR and he, taken by surprise and unprepared, said the fateful words: As far as I know, immediately, effective without delay. Then he confirmed that the crossings into West Berlin were included. With that, thousands of East Berliners showed up at the checkpoints. The guards hesitated, waiting for orders to shoot, and finally at 10.45 pm the commander at Bornholmer Strasse conceded and let people out, with no checking of their papers. The West Berliners were lined up, waiting to see what would happen, and tension had climbed immensely. With the flood coming out of the East, Westerners embraced them, crowds climbed up onto the wall to dance and sing, and spontaneously began chopping away at that hated structure – and the world changed, with the end of the USSR by the close of 1991. But remember -1.5 billion live under Communist rule today in China, Vietnam, Laos, Cuba, North Korea. Angry West Berliners go at it! But it is another anniversary today in Germany. 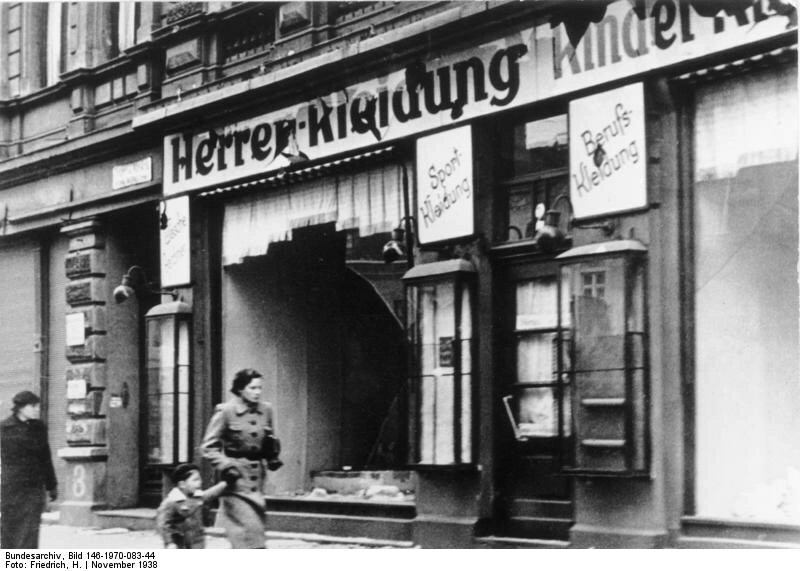 Seventy-six years ago, the Nazi Government in Berlin orchestrated the Night of Broken Glass – Kristallnacht – the outcome of all the anti-Jewish legislation passed 1933-38, with a “spontaneous” action throughout the country. 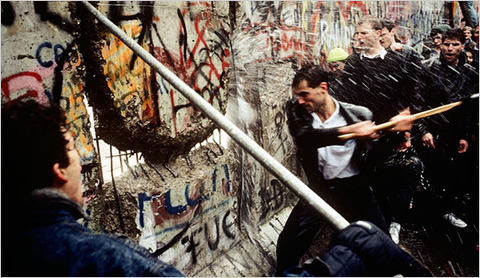 And it is because of this atrocity and so many others, that Berlin was divided in the first place. The blatant destruction – streets filled with glass from windows of Jewish stores and houses – with no police action, woke the world up to just how bad it was in Nazi Germany. Germany’s Jews began to flee in greater numbers than ever – but to where? So many fled to former safe areas in Europe, never thinking to cross the English Channel or the Atlantic. But anti-Semitic government workers, Depression restrictions on workers coming to countries with high unemployment combined to limit safe refuges. Hitler’s insane hatred of Jews and equally insane plans for German expansion permanently changed Europe. People say “never again” but how long did it take for help in Bosnia? In Rwanda? Who has intervened in Darfur? For the Christians of the Middle East? For the Muslims of Burma? Never again – but “never” has come and gone. God help us. And grant that those who are in the wrong will repent, and that those who are endangered will be saved.